Here we are at the final segment of N.W. Overstreet’s 1940 interview at the Portland Cement Association’s Spring meeting published as “An Architect Reviews Five Years with Architectural Concrete.” If you missed the previous two segments, make sure to read Part 1 where we get Overstreet’s background in architecture and his introduction to concrete construction, and Part 2 in which Overstreet discusses particular projects and how he dealt with clients who were hesitant about the material. Today, Overstreet gets into dangerous territory, the problem of cracking in concrete buildings, or as Theodore Dalrymple called it in his “The Architect as Totalitarian,” “the horrors” of the material. In addition, if you’re in the sound of my voice, be sure to head down to the King Edward Hotel at 10 AM for the ribbon cutting of this long-vacant landmark. and how have they functioned for you? MR. OVERSTREET: Contractors at the beginning were skeptical of figuring on architectural concrete buildings. They were afraid of them. But now, because of the help of your superintendents, the contractors have become interested in this type of work and they have taken a pride in it and you ought to see those superintendents get on the job. They are getting results and giving satisfaction everywhere. MR. BOASE: Mr. Overstreet, when we started, I had hopes that if we could get contractors that could do architectural concrete and use the care that is necessary to get the finish they want, that when they got onto an ordinary structural job such as a retaining wall or frame of a building, the care they had learned on architectural concrete would follow through. Have you had occasion to notice any tendency to that? MR. OVERSTREET: Oh yes, that is true. MR. BOASE: Do you think you are getting better structural work too because of that experience? MR. OVERSTREET: I have that feeling. MR. BOASE: Well, we have some troubles with architectural concrete. We know that one of the things that some architects complain about is a lack of uniformity of color on the face of a building. Some architects want that. I find that a few architects will say “Well, that gives spirit to the thing: it gives life to that wall.” What do you think about that? MR. OVERSTREET: I remember when we used to use face brick that we wanted all the brick the same color. About the time I started out the trend was to see how much variation we could make in these brick and how rough they could be. A play of shadow on the surface in the sunlight made the surface interesting, and the same thing would apply to concrete. A variation in the shade of color makes the surface more interesting than if it was all one shade. That is applied everywhere you look. In your stone buildings around here you will notice a variation of color and also of texture. lt is universally so, and of course the same thing applies to concrete surfaces. MR. BOASE: Now the other disease is that of cracking. MR. OVERSTREET: You are not bringing that up? MR. BOASE:Yes sir, I want to trot it out here. Let’s be honest even though we may get fired. I think the Long Beach earthquake proved pretty definitely that cracks do not mean a thing structurally. I don’t think they weakened those walls one bit. What about the cracking from the architectural point of view? MR. OVERSTREET: That is a weakness of monolithic construction, not from an architectural standpoint of view–we don’t care about the cracks–but it is the layman that we are trying to sell these concrete buildings to. All that propaganda that the bricklayers and the brick manufacturers put out about a cracked buildings–my goodness, that Bailey Junior High School has cracked all to pieces. I heard it everywhere I went for a long time. Then the government accepted the building as satisfactory. standpoint to eliminate cracks. Cracking is the only thing against architectural concrete. We have got to develop something to eliminate cracks or fill the cracks after they come in the concrete because cracking is the only thing in the world against concrete. MR. BOASE: Mr. Overstreet, we have tried unsuccessfully to hire Dr. Westergaard, Dr. Timotshenks and two or three other elasticians, to try to solve the problem of cracks in walls. At the present time and for two years we have had an investigation going on by means of models at M.I.T. which is just now beginning to show some results and I feel with you, that we are going to lick the crack and I would rather prevent it than repair it. MR. OVERSTREET: For instance. here at the Columbia School, I just want to bring this out–that building was built during January, February and March. Of course, you know we don’t have much freezing weather down there. We did have some this year, but there is only one crack in that Columbia School and that is on the front right below a window. It appeared in three days. The thing to do is to study these buildings over periods and analyze them. MR. BOASE: Mr. Overstreet, at the present time we have 50 buildings under regular periodic observation. Assuming that the Byzantine type of architecture was developed to take advantage of terra cotta and the Gothic was invented to take advantage of a certain stone, do you think that concrete is applicable to any style of architecture? Don’t you think it is going to come down to a question of dollars and cents in the final analysis? MR. OVERSTREET: Concrete is going to be applied to the modern type of architecture and I think the modern type of architecture is created in America for the American style. It is simple and from a utility standpoint, very applicable. The Classic will be passe. MR. BOASE: Mr. Overstreet, it was very gracious of you to come here and give these gentlemen the benefit of your views. They aren’t architects: neither am I and sometimes it gives us an entirely different slant if the man who is producing the material gets the viewpoint of the man who uses it. Thank you very much, sir. You can also see the whole Overstreet interview, in its original version with photos and captions and all, courtesy of the helpful people at the Portland Cement Association. As with previous segments, this text is reproduced with permission of the PCA. I’d like to know what Overstreet was reading back then. “The Classic will be passe.” Sounds familiar (and funny!). I’ve also always wondered what was in Overstreet’s library, but as far as I know, while many of his firm’s plans ended up at MSU, the library doesn’t exist anywhere, or even a list of what was in it. You’re right, that’s a great line, and really gives alot of insight into his thinking. I never realized how anti-classical he was–or maybe not so much as anti-classical, but believing that its time had passed and it was time to move on. Lol, that’s funny, but a brilliant insight! It really does have a classic Palladian form when you stop to look. Don’t know how I missed this comment way back then, but I think she meant Roman as in the Roman Empire. 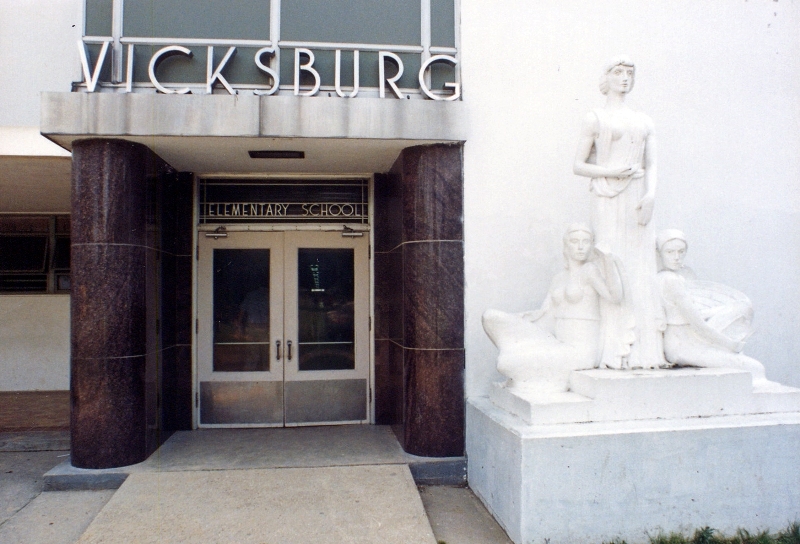 Thanks for pointing me here; that (Vicksburg) is a great school building. 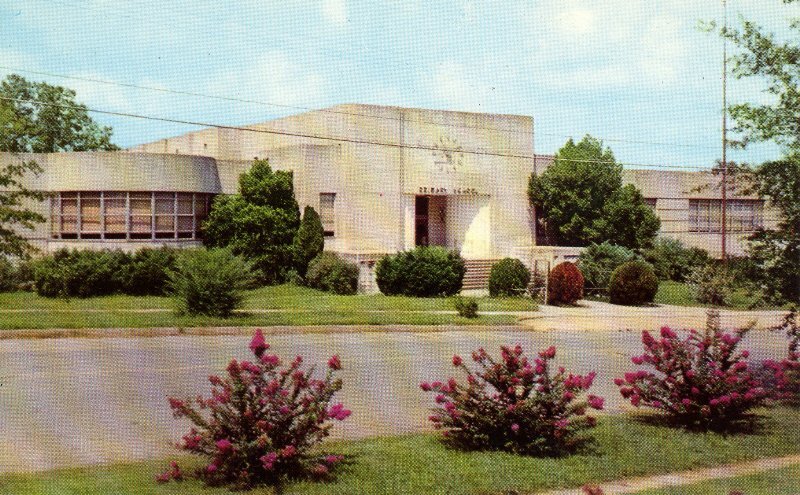 Do you know if the Church Street School in Tupelo is still standing? It looks like a real period piece, definitely want to check it out. Yes, it’s not only still standing, but still in use as an elementary school. It’s on North Church Street, north of downtown.